Nest Cam Hands-On Review 2019 — How Does the Original Hold Up? Even with new and improved models out there, the original Nest Cam is still worth a look. Nest Cam isn't all that it's hyped up to be, but it has a sleek design and some cool functions. Read our review and see if the Nest Cam is right for you! Nest Cam has long been a crowd favorite for its versatile mount, easy installation, and smooth integration with all things Nest. Since its Dropcam acquisition a few years ago, Nest has built on its success and released newer, better versions of its flagship security camera. So, we thought we’d borrow Hermione’s Time Turner, turn back the clock, and see how the original Nest Cam Indoor holds up and whether it’s still worth considering today. One of the biggest standouts for the Nest Cam Indoor is the versatile mount that it carried over from the Dropcam. You can completely disconnect the camera from the mounting bracket and place (or drop) it anywhere you like. This versatility is only slightly spoiled by the need to be within a cord’s length (10 feet) of an indoor power outlet. Dimensions: 6.5 in. x 3.8 in. x 6.6 in. 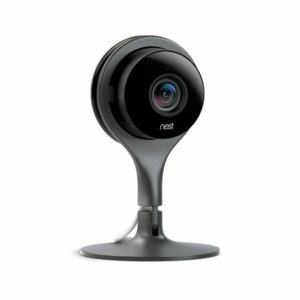 The flexible mounting options combined with 1080p HD resolution make the Nest Cam a great choice for a nanny cam since you can install it in a discreet location and still capture a high-quality image. Setting up our Nest Cam actually took less time than getting it out of the box. (For real. That thing is packed in there pretty tight.) Nest has streamlined the setup process to make it as easy as possible. It’s a quick four-step process. Step 1: Download the Nest app and create an account. Step 2: Plug in and power on the camera. Step 3: Scan the QR code on the back of the Nest Cam. At 1080p HD resolution, the Nest Cam was the best of the best when it first came out a few years ago. But that also means it still holds up well against the competition today. We set it up on our mantle and were able to make out clear details in the kitchen and living room area, 30+ feet away. The Nest Cam also has a 130° FOV, which meant we could keep an eye on multiple entrances (front door, garage entry, and sliding door) all within the same frame. Not every floor plan will allow for this type of coverage, but for us, the wide FOV was ideal. Nest’s notifications left something to be desired. We were a little disappointed because when we purposely triggered the motion detection, our Nest Cam took several minutes to notify us via email. It’s not necessarily a deal breaker since the Nest Cam does so many things well for a reasonable price, but it’s definitely something to consider if you prefer timely notifications. It’s worth noting that if you pay for a Nest Aware subscription, you gain access to an Alert Summary feature, which does exactly what it sounds like—it gives you a summary of any notifications and alerts you received, all in one place (the Nest app). The Nest Cam comes with some standout features like Activity Zones, Timelapse, and Nest integration through the Nest app. Keep in mind some of the advanced features (Activity Zones and Timelapse) are available only with a Nest Aware subscription. Activity Zones might be our favorite feature of the original Nest Cam. Basically, it allows you to select a specific area to focus on within the Nest Cam’s view. So, for instance, you can set up the camera to ignore the bottom half of the screen so you don’t get a notification every time your dog walks by (unless you want it to). Or you can select the area around your entryway so you get an alert when someone enters your home. Activity Zones is a very practical feature, and it helps the Nest Cam know when to notify you so your phone doesn’t blow up with needless alerts. Just because you’re recording every minute of every day doesn’t mean you have time to review the footage. This is where Timelapse becomes your best friend. It gathers footage triggered by motion throughout the day and displays it to you in quick succession. This means you review only the video clips that actually show activity instead of looking at hours of footage of your empty living room, You can jump to triggered footage and quickly scan for any unusual activity. 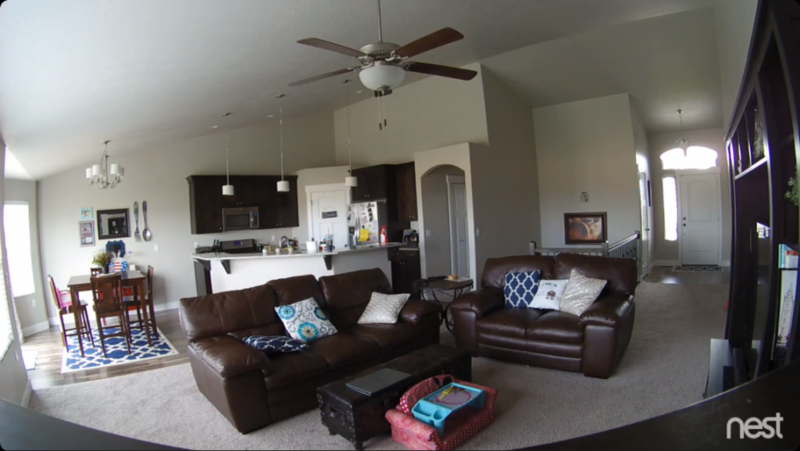 Nest Cam easily integrates with other Nest products through the Nest app. This used to be limited to the Nest Thermostat, but as Nest has released more smart home devices, integration is playing a much bigger role. Nest is also set up to work with other IFTTT devices. Most smart home devices have some level of integration with Nest, but just to make sure, you can look for the “Works with Nest” sticker. Night vision range 20 ft.
MSRP for the Nest Cam Indoor is $199.99, but you can almost always find it for cheaper on Amazon or another online store. Less than $200 for an indoor security camera with the versatility and video quality of a Nest Cam? That’s really hard to beat. So, if you’re looking for the best bang-for-your-buck option, definitely check the Amazon price on a Nest Cam. Paying for Nest Aware gets you two things. First, you get access to video cloud storage—beyond the abysmal three-hour storage limit you get for free. And second, you get to use the advanced features we mentioned above (mainly Activity Zone, Timelapse, and Alert Summary). Here’s what a Nest Aware subscription will cost you. We have a love-hate relationship with the Nest Aware subscription—that is, we love all the features it unlocks, but we hate paying for it. Technically, it’s an optional service, but if you want your Nest Cam to be anything more than a glorified live-streaming webcam, you should plan on paying the $10 monthly subscription. Don’t get a Nest Cam if you’re not willing to step up and pay for a monthly subscription. All the really cool features and capabilities come with Nest Aware—without it, Nest Cam is just a really nice live-feed camera. That said, even after a few years of competition and upgrades, the Nest Cam Indoor is still a formidable security camera. Its 1080p video quality and 130° FOV compete with almost any camera on the market today. And when you consider you’re getting that for less than $200, it almost feels too good to be true. Have you tried Nest Cam? Let us know about your experience in the comments below. Kyle has been creating people-first content for the better part of a decade. 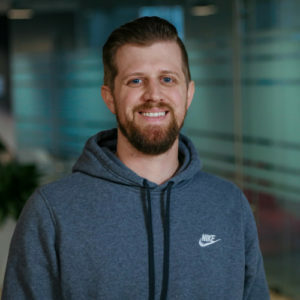 His work has been sourced by major publications like Wirecutter and KSL.com and featured on KSL TV. On top of reviewing home services for consumers, Kyle is a panelist on The Legendarium Podcast where he reviews Fantasy and Science Fiction literature, geeks out over the MCU, and drops terrible puns at the least opportune times. Great camera system. Package is awesome. Set up is awesome. I am going on 1 month since Nest took what looks to be an extra $129 from my bank account for a subscription. However there is no way for a customer to look up exactly what happened online. Calling in I have received multiple stories and non of them line up. While I type this I am going on 1 hour 55 minutes on the phone trying to sort it out. This is my 4th attempt over the last month to do so. Don’t buy these unless you like horrible accounting customer service. BTW I purchased 20 plus nest products and when there are defects they beat around the bush and don’t take care of you. If there is any way they can get off the phone without spending the money to replace their faulty product they will do so.